You never know just what kind of drawing is liable to come out of a small studio overlooking Lake Erie at NEA Service’s comic art headquarters in Cleve­land. It might be an editorial cartoon, or a story strip illustrat­ing an event in American history or a biblical anecdote, or an illus­tration for a fiction piece, or a Sunday page for the new “Little People” comic feature. 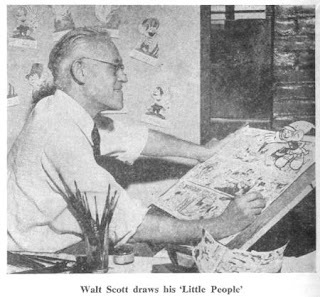 The ver­satile cartoonist who turns out all this, and more, is Walt Scott, a triple-threat man at the drawing board if ever one there was. Biggest of these projects now is “The Little People” and its com­panion strip, “Huckleberry Hol­low,” launched by NEA Service last spring and now appearing in almost 200 newspapers. Many more will use “The Little People’s Christmas,” a special series of 21 strips using characters of the Sun­day feature but with a plot all its own, for release Dec. 1 to 24. And NEA expects new clients for the regular Sunday page when a new sequence starts Dec. 28. In the early twenties, after a short stint in the advertising art de­partment of the Cleveland Press, Scott joined the Cleveland Plain Dealer and here the “Little Peo­ple” first found their way into print. They were called “The Doonks” then, and made a Sun­day children’s feature. Scott made his name for versa­tility when he rejoined NEA about ten years ago. He “specialized” in fiction drawings, special feature work and comics, pinch-hit for the regular NEA editorial cartoonists and originated the story strips which the service has been dis­tributing for special holidays in the past year or two. Revival of the “Little People” characters he launched 30 years ago has round­ed out his career. Tall, mustached, gray-haired and fiftyish, Scott likes to spend his non-drawing hours—yes, he does get away from the board once in awhile—hunting and fish­ing or entertaining his four grand­children with tales of the “Little People.” Occasionally he takes a busman’s holiday at water color paintings, many of which have been displayed at the Cleveland Museum of Art. Soy coautor de “Mark Kane. Detective en Hollywood” (dailies & six comic adventures, published By Cimoc, andi Italy Publishers) junto al dibujante Oswal. Discípulo de Crane e Eisner.